As Ming-Chia Chen gingerly sat down on a cardboard chair, eight Indiana State University students looked on in anticipation. "Yea," Chen said when the chair held her weight. 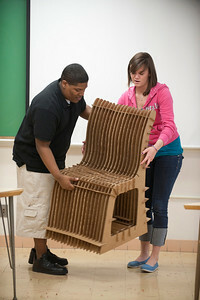 Family and Consumer Sciences 151: Design Fundamentals students designed and built chairs as if Chen were their client. She will use the chairs in her master's of fine arts thesis exhibition April 5-16. Chen designed a coffee table and a bar for her coffee shop exhibit, but the first-year interior design students created the chairs. Chen designed her coffee shop around the concept of global warming. The students used recycled cardboard for green construction of the chairs. 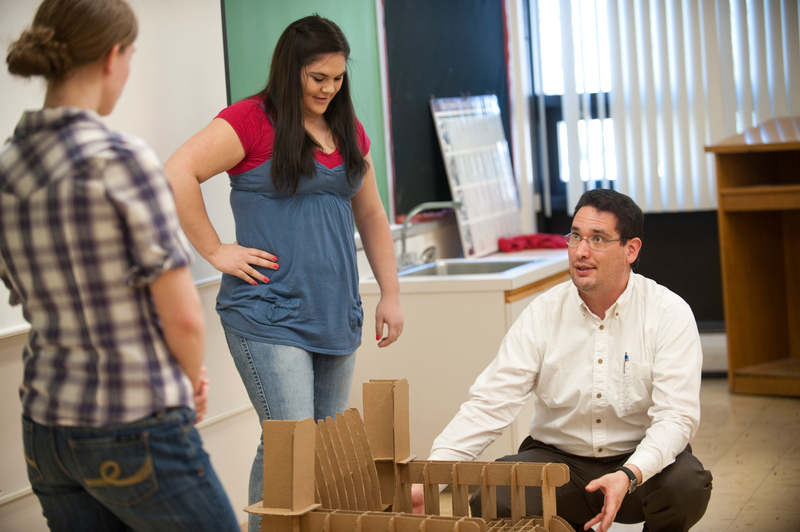 "The students have worked very hard," Chen said. "I appreciate it." Working with the undergraduate students was fun, she said, because she spends a majority of her time in her graduate classes discussing theories. "In here [FCS 151], they are experimenting, figuring out what to do and how to create things," Chen said. "It was so much fun." The students divided into groups and designed chairs made of corrugated cardboard. They could use no glue or other adhesives in assembling the chairs, which had to support a 250-pound person. "As interior designers, we don't just design interior spaces. We also design the furniture that goes in that space," said Juan Jurado, assistant professor of interior design program and professor of FCS 151. "We try to show them how to use different materials." The students took measurements of chairs and the human body before designing their chairs. They ran into various difficulties along the way. "I learned a lot about cardboard-the right and wrong ways to use it," said Kelly Shulman, a freshman interior design major from Bloomington, Ill. "Assembling it was the hardest, but facing the different problems we came to along the way was hard, too." "We really didn't have that many main elements, but each piece had to be exact," said Cindy Bondy, a freshman interior design major from North Salem, about her group's design. Brie Condon, a sophomore interior design major from Pendleton said the project took about 20 hours outside of class. "It is one of the best feelings in the world, though, when it's done," Condon said. Shulman said the project helped her learn about basic design elements. "We hadn't made any structures that had to hold anything before," Shulman said. Taylor Valandingham, a sophomore interior design major from Terre Haute not only learned about support and design, but she also learned about overcoming challenges. "The hard part was having to restart over again and then when an idea didn't work, rethinking a solution to the problem," she said. Designing a chair is a part of the FCS 151 curriculum, but this is the first year for the students to collaborate with a graduate student for a master's thesis exhibition. The reception for Chen's exhibit will be April 9 from 5-7 p.m. in the University Art Gallery in the Center for Performing and Fine Arts. Family and Consumer Sciences 151: Design Fundamentals students designed and built chairs for a graduate student's exhibition.